The sound of a 1950s Strat® but with a little bit more attitude. The Fender® Fat '50s Strat® Pickups give you calibrated pickups constructed with hand-beveled, staggered Alnico V magnets and Formvar magnet wire. The Fender® Fat' 50s Strat® Pickups deliver enhanced bass response without the harsh midrange. The middle pickup is Rw/Rp (Reverse Wound/Reverse Polarity) for hum canceling in positions 2 and 4. OEM on the American Stratocaster® and Custom Shop Fender® Showmaster series Stratocaster® guitars. Hand-beveled, staggered Alnico V magnets. Middle pickup is Reverse-Wound/Reverse Polarity for hum cancelling in positions 2 and 4 on the 5-way switch. Sold individually only on this page. Two Phillips oval head mounting screws. Two rubber surgical tubing height adjustment pieces. For The Complete Set of 3 Purchase Here. IMPORTANT NOTE: As of mid 2015 Fender has discontinued all individually packaged pickup sales, so what you will be receiving by purchasing a single pickup here will be bulk packaged since these individual pickups come from an open box original set of 3. We pack these in very nice plastic cases and each pickup is tested and documented for correct operation. Wiring diagram is not included. 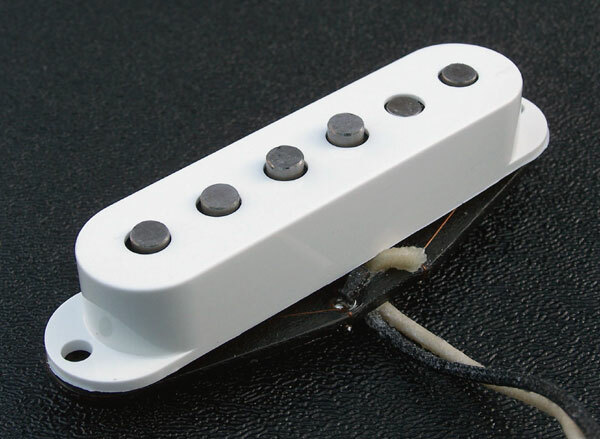 * Warranty is not available with these individual pickups since they are only 1 pickup from an original set of 3.